I have a few little tidbits that didn't make it into posts this week. A reminder for those of you with pets out there - Rachael's Feed Your Pets special airs tomorrow at 9:00 pm. Also, there's an auction closing today at 6:00 PM EST over at Charity Folks to benefit the Alzheimer's Association. You can bid on 2 VIP tickets to Rachael's show. Right now, the current bid is $1,000. As for me and Baby Miller, things are going well! This weekend my best friend is throwing a shower for us, which will be very fun. It's like a wedding - lots of my college friends will be there and we'll get the chance to catch up. I think there might even be some Rachael Ray recipes on the menu (who would have suggested those? ), so I will report back! Talk Show Ratings Update: Broadcasting and Cable informs us that, along with a few other talk shows, tied its season high in the third full week of the February sweeps: "CBS’ Rachael Ray rose 5% to a 2.3, and it was the only talk show to gain on the year, also rising 5%." Rachael's buddy Valerie Bertinelli is getting her own talk show, according to TV Squad. Patsy at Family, Friends and Food tried Super Sloppy Joes. I've never reviewed them here, but I can tell you from personal experience that you'll never go back to the stuff in a can! Cook. Craft. Enjoy. features a review of That's Shallota Flavor Pasta from Every Day with Rachael Ray. Sean Atkins of One Week Job reports back on his time at Rachael Ray's talk show. Idolator comes to Rachael Ray's defense regarding her SXSW party. The Akron Beacon Journal tested a recipe from Rachael's newest cookbook, Just in Time, and made it in 45 minutes. Sara of Noodletown doesn't like the name of the recipes she tried, but loved the results. Kelli Best-Oliver of Eat. Drink. Better. 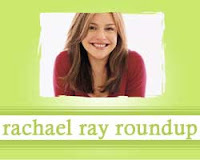 writes a post in defense of Rachael Ray. Lori of My Wooden Spoon discusses how great EVOO is. Thank you for the link love:) Your blog is so vibrant and well laid out. You've got a great blog..keep it up!